You asked. And we delivered. 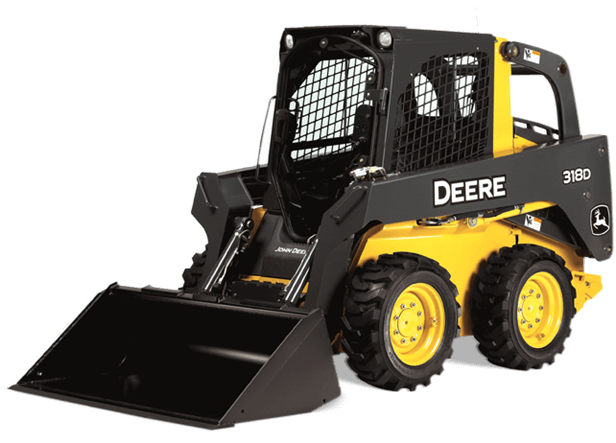 Loaded with customer-inspired enhancements, our redesigned 318D Skid Steer incorporates a roomier operator station, a quieter pressurized cab with best-in-class visibility, and a curved-glass swing-out door. You also have a choice of numerous productivity-boosting options including electrohydraulic(EH) joysticks with selectable control pattern and variable boom and bucket speed settings. Other innovative advantages include a highly efficient and easy-to-clean V-plenum cooling system. And an easier-starting electronic fuel-injected PowerTechT E diesel. As always, grouped checkpoints, advanced diagnostics, and wide-open access help speed servicing, minimize maintenance, and lower daily operating costs. To learn how the 318D can help you get more done, more reliably, for less, talk to your John Deere dealer.